John and Theresa Tomasini have greatly enjoyed boating and fishing with their 28’ Carolina Classic for the better part of 15 years. Every now and then they have talked about moving up in size but, “other priorities would get in the way,” explains Theresa. So technically every 2-3 years—in their minds—they were upgrading their boat. Perhaps it was replaced by a 34 footer which then moved to a 40, to a 46, to a 50-something… this is the story John tells his friends when they hear about the 62 foot Viking convertible they are building to replace their long-loved express. Originally the Tomasinis imagined building a sportfish with a custom builder, and they attended many-a-boat show thinking and dreaming about this special next boat. Their current boat had always been kept at Sunset Marina in Ocean City—a stone’s throw away from the Bluewater office at the Ocean City Fishing Center. One day Bluewater’s stock Viking 62 caught their eye, and they inquired for a tour. Salesperson Scott Steffy met them to look over the boat on several occasions as the Tomasinis warmed up more and more to the thought of moving up from their current 28 footer—for real this time. As their interest grew and the questions became more involved and technical, Bluewater partner and Viking expert Earle Hall was brought into the process. “Earle has been exceptionally accommodating,” Theresa explains. “He is incredibly knowledgeable about the Viking product and is always very responsive to our questions and wishes.” Earle and Scott helped to organize several sea trials for the Tomasinis and invited them to Viking’s Annual Dealer Meeting in Atlantic City, NJ along with the VIP event in Riviera Beach, FL. They were torn between a 55 or the 62, and although both were equipped with a Seakeeper gyro stabilizer, Theresa recalls, “we felt the comfort level of the 62 in rocky seas was worth the jump.” This new found love for gyro technology, paired with the couple’s desire to have a second home, pushed them to pursue the larger of the two convertibles. They still wished to customize many aspects, but thankfully Hall’s strong connections with Viking’s Healey family and the company’s willingness to accommodate nearly all requests helped to fulfill those dreams. Their under construction Viking 62 will receive options such as a full teak cockpit with teak coaming and gunwales, and a faux teak toe rail, but why stop there? They are also adding a teak sole to the flybridge Theresa says. They have worked closely with Release Marine to match the lounge backrests on the bridge with the ladderback style helm chairs. Release also custom designed a removable table for the settee located forward of the main helm. Interior appointments include crown molding throughout with a custom dark walnut chair-rail that spans both sides of the companionway, plus finished wood frames around the shower doors. Without question though, the most noticeable and remarkable additions to their Viking 62 are the custom designed glass pieces by internationally recognized artist Chris Channell. 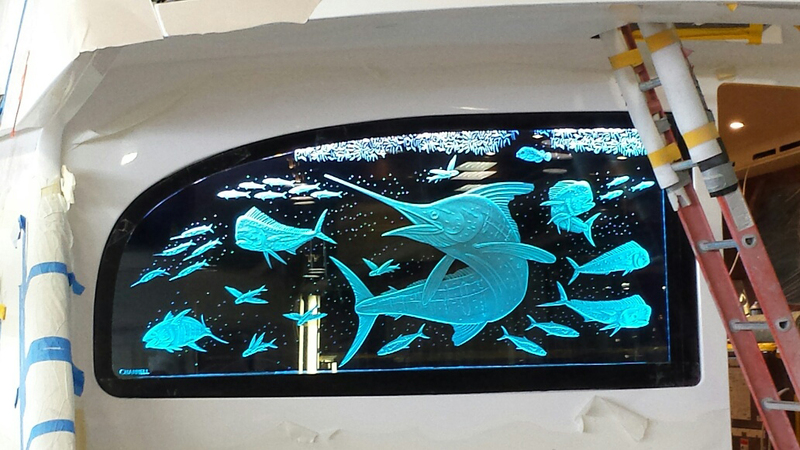 Depicting a large marlin amidst schools of pelagics and baitfish, this etched glass artwork functions as a typical window between the cockpit mezzanine and main salon, yet serves as a striking centerpiece for both spaces. The scene is made more realistic with the addition of LED lighting at the edges of the glass: white on top to simulate bright sunlight giving way to a blue-green hue beneath, breathing life into the gamefish. In addition to the full-window glass art, John and Theresa have also commissioned a coral reef image for a cabinet face in the galley. To help create greater depth to the image, the artist will design two separate sheets of glass and then mount them together to create a truly three dimensional image, also edge-lit with LEDs. This request will be more difficult to implement for the Viking team, but always willing to take on a unique challenge, the additional artwork will be incorporated without sacrificing storage space in the galley. The broader strokes for the boat’s exterior will include a full tower and electronics package from Palm Beach Towers and AME as well as a shimmering metallic hull painted in Alexseal Palma Blue. Being involved in the build process has helped the Tomasinis to truly appreciate the craftsmanship of their new yacht andthe expertise the Viking team has to offer. Theresa explains, “As we have become more engrossed in the build process, wehave been enchanted with Viking as aboat builder. Touring the facility… talkingto captains… demo rides… the more welearned, the more there was to like. Plusthe customizations sealed the deal forsure.” Not only did the many demo ridesand sea trials help to secure their choice inthe length of the boat and the requirement of a Seakeeper, it also helped them decide on an engine upgrade. “No smoke, super quiet and a top performer,” John said of his impressions of the MTU-powered Viking he demoed. The Tomasinis plan to keep their new Viking, to be christened Theresa Jean, back at Sunset Marina during the summer and then head south for the winter. For them, this much larger boat will usher in all new capabilities and experiences in cruising and fishing, along with the opportunity to dock her in the Florida Keys in the winter and visit family in Massachusetts in the summer. John hopes to better hone his fishing skills in these varied waters, but first things first—as soon as they take delivery in July, they plan to fish as many of the mid-Atlantic tournaments as possible, starting with one of the most grandiose— Ocean City’s White Marlin Open. Theresa points out that Scott Steffy’s many roles will be far from over after delivery; he’s agreed to captain the boat for the fishing season and help the Tomasinis get settled into their new yacht. With her full tower, stunning custom glasswork, and a metallic blue hull framed in copious amounts of teak, Theresa Jean should be easy to identify as she travels throughout the eastern seaboard!